was sold, or left behind. I only pretend to know. 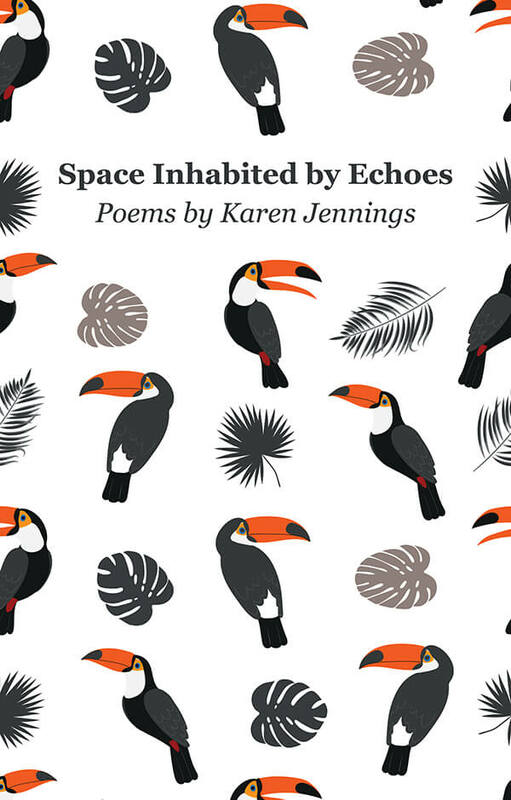 Space Inhabited by Echoes is a very frank and poignant collection of poems in four parts inspired by the author’s personal experiences. It takes the reader on a journey from the first pangs of love to settling down to a new life. Part I is about relationships, tentative beginnings, a liaison gone sour, of relationships before. It’s also about finding your feet in life and, looking back, be surprised at how far you have moved on. Part II is about emigrating to a completely new country in order to be with the person you love. Moving between continents, from South Africa to Brazil, Karen Jennings eloquently describes how this affects her personal life and her relation with her husband. Not side stepping the problems of adjusting to a new environment, very appropriate for these times, when many people have to come to grips with life in a new country. Part III is about accepting reality and learning to enjoy new experiences. It shows the author’s fascination with the flora and fauna around her. This theme is prominent in all of Karen Jennings’s work. the melon we’d thrown out. Part IV is inspired by some of the people who formed her, mother, grandfather and a twin that never was. It highlights the bittersweet aspects of dealing with close relatives and an unexpected surprise at finding out about a new family member. that burns with so much love. Daring and personal, Space Inhabited by Echoes reminds you of Sylvia Plath’s poetry. Space Inhabited by Echoes was published on 17 May 2018. For more information and review copies please contact the publisher: Bernadette@hollandparkpress.co.uk, + 44 (0) 7792611929. The launch was celebrated with a party on Wednesday 6 June in The Book Lounge 71 Roeland Street Cape Town 8001. Other work by Karen Jennings published by Holland Park Press: Finding Soutbek, a novel about the plight of poor black people present-day South Africa, shortlisted for the inaugural Etisalat Prize for Literature, Away from the Dead, a short story collection, mostly set in South Africa, and Travels with My Father, a memoir and the author’s account of mourning for her late father. ‘Authors like Margaret Atwood, Nadine Gordimer or Jeanette Winterson impress with their literary chameleon natures. Karen Jennings is only at the beginning of her career as a wordsmith, but is showing all the signs she is destined for the kind of greatness the writers mentioned above have achieved in the course of their lives. The poems are intimate and deeply personal, but still hold universal truths. ‘Space Inhabited by Echoes is an enjoyable albeit sometimes disturbing read, taking us through life in ways that are both familiar and frightening.